Ola, the Wonder Dog, left us this week. She hadn’t been herself , activity-wise for a while, but her essence never changed. “Ola” (the African definition, not “hello” in Spanish), was rescued as a precious puppy, by my sister and her husband more than 10 years ago. Soon after they brought her home, they left on an amazing trip abroad for several weeks. So James and I got to be Ola’s Foster Parents while they were gone. We seriously bonded with her during that time. I mean, look at this face! Who wouldn’t?? Ola, about 10 weeks old…see the Angel on her chest? John and Lenore had wanted a young dog while their elderly one, Lily, the Three Legged Miracle, was still able to teach a new dog the lay of the land. This family lives on a glorious piece of land on San Juan Island. The property includes lots of acreage, a large pond with a variety of water fowl, a Bamboo Farm, and arguably some of the most beautiful and prolific vegetable and flower gardens in the Northwest. And they live in what James and I lovingly call the Hobbit House. Built by John, using lots of found and custom designed materials, it is so fairy tale-like, you are transported to another world. When they chose Ola as a puppy, they wanted another smallish dog that would not overwhelm Lily, and they predicted Ola was another small, lab mix’ just like Lily. Not many months later, Ola had grown into a HUGE, beautiful, regal dog, over 100 pounds. But she still seemed guided by that angel on her chest. Lily immediate adopted young Ola, and trained her to be a “stick right close to your Humans” dog. No fences in the Hippie Valley part of San Juan Island. Dogs (and deer) are free to roam and except for the occasional “play date” with a neighbor Dog, both Lily and Ola were right there, watching over the homestead, 24/7. Lily left us not long after Ola joined the family but the two of them had some really good times together before she died. She taught Ola how to play Tug O War with ropes and sticks when Ola was still very young. Ola became such a big part of our house-sitting experience all these years. For several weeks at a time, she became “our” dog again. No matter how much time passed between our babysitting jobs, she would greet us with 100 pounds of enthusiasm! and stayed close to us at home. Yep, she was our dog…..But only until her real parents came home! Ola was always within feet (or calling distance) of John and Lenore during their daily routines. Ola was one of the sweetest, most gentle dogs I’ve ever met. I will miss her so much. I can only imagine how long it will take her family to get used to the huge empty space she leaves behind. Here’s my story…long, but it makes me so happy every time I tell it. When I was two, my Mom and me found me a Dad. They got married and had my sister Eileen when I was three. They had my sister Barbara when I was six. When I was nine, I found out that Dad was not my first Dad. I don’t remember that fact being particularly bothersome. But when I was twelve and my folks divorced, well, that was definitely bothersome. When I was fifteen, being fairly exhausted by the role of Junior Mother to my sisters while my own Mom drank herself into oblivion, I left home in search of the rest of my childhood. When I was nineteen, my mother made her first (at least discernible) suicide attempt. (She took pills.) She survived, but only after being in a coma for as many days as I had had years on the planet. She woke up saying, “I don’t want to sleep anymore.” I thought she meant it and was really relieved and hopeful. Her narrow escape from death seemed to inspire her. She turned her life around dramatically…but only for a couple of years. When I was 21, my mother was more determined…no reprieve this time. It is much harder to survive suicide by gun. As of this writing, I don’t remember how he answered that question. I think it was something sweet and positive. I do know that after he died in 2001, when we were going through his belongings, I found that 30 year old note from me, crusty with age, in a small box full of obvious treasures; like a very beautiful picture of my mother (his one and only love), correspondence from his father, and a very impressive letter of endorsement from his commanding officer in the U.S. Cavalry recommending him to West Point. My barely camouflaged plea for parental reassurance was in very admirable company indeed. When your mother and I got married, we didn’t have much money and you were very young so we didn’t think you would mind if we skipped the legal proceedings for me to officially adopt you. Then, as it does, time passed and we just never got around to it. Would you think it silly now, at this late date, for me to make it all legal? Would you let me adopt you? I think you know that you have never been any different in my eyes from your two sisters, except that you were my oldest. Your biological father left before you were ever born, marrying your mother in name only, at the “insistence” of your grandfather, so I knew I would be your only Daddy. Have I ever told you when I knew you were mine? When your mother and I were dating, we always brought you along. I knew from the start it was a package deal with her and that was just fine by me. One afternoon when we were out, I picked you up to carry you on my shoulders, as had become our routine. Well, while you were up there, you had a little accident and leaked all over my neck. That wasn’t too bad really. But when I went to change my shirt and tie later, I found that you had marked me. My white shirt and neck were stained a bright crimson, the color of my tie. I didn’t think of myself as a “red neck” but I proudly wore that red mark around my neck for several days until it finally wore off. I told the guys at work that my new little girl had branded me. That’s when I knew I was your Daddy. Now, I would like to make it official if that’s OK with you. Let me know what you think. My response to him was a no-brainer. So, the Christmas after my 40th birthday, my Dad flew to Seattle from San Diego. My sister Barbara was there. My sister Eileen, who had rarely seen any of us since our mother died all those years before, flew over from Hawaii, and my 2 long time best friends, Lee and Linda, attended as witnesses. It was definitely official, taking place in a courtroom in front of a judge who asked both my father and I a peculiar series of questions. “Do you have any ulterior motives for taking this step?” “Does doing this help you to avoid legal action in any way?” “Are either of you doing this for financial gain?” etc. Judging from the things my Dad did during the time immediately before he died, my legal adoption was not the first time he had considered my sisters and I being re-united. Although he had never uttered a single word of criticism or advice concerning our long-time estranged sibling ties, clearly he had thought about it. He simply carried on three separate father/daughter relationships. He developed his own connection with his 3 grandchildren and before his death he fixed it so that at least once more, we had no choice but to all three be together. I mean really together. We had to join up and cooperate in the dispersal of his estate. All papers had to be signed by all three of us at the same time. There was even plenty of money designated specifically for travel expenses from our respective far corners, etc. Clever, clever man. Either that or he was a real brat. I wonder what that attorney thought of the look of shock, dismay and wonderment that passed among my sisters and me in that moment. Dad, I’m sure, was chuckling. I guess he really believed that it is never too late. Oh boy, I accidentally did a whopper piece of personal therapy this morning, searching for a song about Search. I immediately thought of all my life long searches! First, my youth, I searched for my biological father who left before I was born. I know, in this day and age, it should be easy right? Well, his name was Michael John Kelly. (Might as well have been John Smith!) I started at 13 years old, looking up that name in local libraries. They used to carry phone books from all over the United States, so, using my babysitting money, I would write post cards to as many addresses as I could afford postage for. Then, in my twenties, I started searching for my daughter, who I had to give up for someone else to raise. Here’s the piece of work I did this morning. At 70 years old, there are so many other things I still and always searched for that are unlikely now. That’s not me giving up. That’s the healthiest part of me, gently and lovingly, coercing me back into the present moment. I guess that pushy voice, my “Guardian”, has always been there, Sometimes it’s audible and sometimes it is blocked by unfinished grief…but it’s constant and reliable when I am willing and able to listen, to hear. And most importantly, to accept that it is there for ME, not just my clients, my friends, my family, not all the other lost souls I share that voice with when I forget to listen for myself. You go Alanis! Thanks for always sharing your “therapy” with us in your music!! Many of us have pets who are or have been Beloved…but my experience is there is usually this one who works his or her way deep into our soul, our memory, and our “inner child”. Though I am fairly allergic to them, I’ve almost always had cats…maybe 15 of them over the years. But there is this one rascal, Zorro, that is my Beloved heart animal, above all the others, my inseparable companion of 17 years now. Named for the “Z” he slashed in the back of my hand the day I got him (at 5 or 6 weeks old). I’d show you a photo of my hand now but the original “Z” has been embellished with countless slashes over these years together…some from anger but mostly from play. It’s more like an abstract pencil drawing these days. I know everyone has a favorite pet even if we don’t want to admit playing favorites. I have three cats right now and I wouldn’t want Phineas the Terrorist or Lucy, the Wonder Cat to be jealous of my Zorro, the Grey Blade. His story is unfortunately, not unheard of. He was left in a box with 5 littermates at the back door of a county animal “pound” at the beginning of a three day weekend. By the time the box was discovered, all had died but my Zorro. Tiny “Z” was put in the cages in the lobby of this Animal Shelter where all the “last chance” animals were displayed…last chance before death!! Apparently, he did not stop yowling for the three days they had him and the folks at the front desk were driven to distraction by his inconceivable volume. We arrived literally in the nick of time. They were so relieved, they all cheered. The short version of the back story here is that about 2 years before, I had lost all three of my long-time pets (an 11 year old cat, a wonderful 16 year old purebred German Shepherd, and an amazing, impossible 23 year old cat) all within two months of each other. Oh and in this same 2 years, my then husband had blown up our marriage as well as my therapy practice, AND there had been 11 deaths in and close to my family…all culminating in the 9/11 tragedy our country suffered. I was a hot, depressed mess!!! My two very best friends did a Love Intervention with me for which I will be eternally grateful. I knew immediately it was that screaming gray and white kitten hanging by all fours on the screened in kennel. I have already confessed many times in previous animal posts that I am the Queen of Anthropomorphism, but that kitten knew me instantly. In our 17 years together, he has never screamed like that again. Oh, we have our regular conversations. He’s very talkative. But only with me. I’m the only one he has ever trusted. If you are not me, you must tread very lightly in his presence. No reaching out your friendly hand for a sniff or a pet. Nope. You’ll be branded, just like me. Though he will tolerate almost any handling from me, he has never been a lap cat, no snuggling except on my feet at night…oh, and if I say “Zorro, wanna take a nap with me?”, he will come running and assume his position in out napping spoon, his back pushed into my curled-up tummy. And a wonderful, weird addition to our relationship is I have NEVER been even slightly allergic to him. No itching, no asthma, nothing. I tell people he is my first intimate relationship with a cat. He will look straight into my eyes for long moments and we will “talk”. He is protective of the other cats we have, both joining our family as tiny kittens. If Zorro thinks you are hurting them, he will lunge at you like a tiger, growling, teeth bared, and claws out. He’ll draw your blood without batting an eye. Zorro, tolerant of anything from the other cats..
Zorro has a much longer story than this, but I want to get this post done. Just think of him as the Sean Connery of cats…a real warrior in his day and still gorgeous to the end. Zorro has advanced kidney disease and will most likely be moving on soon. We spend a lot of time together these days. I know we are getting close to the end because he wants to be on my lap whenever I sit down. He is awkward at it, having never practiced this kind of connection before now, but I love it. I love him. My beloved best pal for so many years…. I just can’t write about my mother(s) today. I will sometime. I know I need to. And since I didn’t get a single card or call or flower and I even had to make my own coffee, I’m feeling pretty forlorn. So I will write about myself. Don’t get me wrong. I love mothering. I live for it. My favorite movie as a child was not some Disney Princess thing. Nope, for me it was “Cheaper by the Dozen”. All I ever wanted was a huge family, a bunch of kids to mother! I even mothered my mother, trying so hard to convince her life was worth living…but I failed…well, that’s how it felt to my broken teenage heart when she finally chose the permanent “check-out”. I mothered, in the following order, myself, my sisters, my mother, my babysitting kids, my pets, my friends, my foster sisters, my boyfriends, my fellow students, my co-workers, my husbands, my neighbors, my BUGS, broken birds, and my hundreds of my clients…this last is a whole separate story of amazing “motherhood”. I mothered myself when my own mother escaped her pain by shooting herself. How oxymoronic is that? And I had to make the excruciating decision to NOT mother the child I was carrying at the time my mother died, leaving my sisters in my real charge this time. Blissfully, I finally got to mother my son Michael, the light of my life, and eventually, a pile of step-children. And now, though I am their grandmother, I even get to mother my grandsons a little bit. It’s still my favorite thing to do. 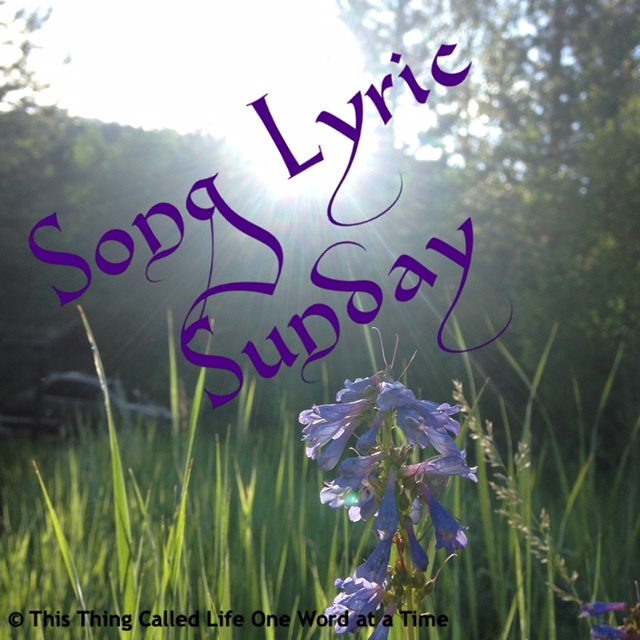 So here is my choice for Song Lyric Sunday, today, Mother’s Day, 2017. It’s the song I used to play for my most injured and damaged clients, in the hope that somehow, a little mother’s love really can heal. I know it has healed me. And I know my “daughter” Pamela has received exactly this from her Mother. I’m off to Mother my CATS!!! They won’t know what hit them! The FIRST kind is the overwhelming winner in terms of numbers of encounters. I see birds everywhere. I don’t even know I am watching for them but I find them where ever I go. The SECOND kind of encounter is spotting evidence of birds…nests, feathers, and POOP. And a Bird Encounter of the THIRD kind is actual contact, in all its forms, including actual “conversations” (out loud or not…). This week I have had all THREE! Not really that strange here in the Northwest. We see them often, but usually just on a fly-by, though I have witnessed a Murder of Crows attacking a Bald Eagle and bringing him to all the way to the ground. That’s another post. This week, on my morning walk, I heard a great commotion among Crows and Eagles. It’s a familiar sound…someone is probably raiding someone else’s nest. But when I looked up I saw FIVE Bald Eagles. There was a pair who seemed to be fighting off the rest. They succeeded in driving off the other three and then landed in a tree a couple of houses away from mine. They chattered and pealed and then were quiet but present long enough for me to walk home and get my camera. But it was an extremely gray day so lousy photos. Sitting at my computer…all the cats having their morning naps…and a loud crack/crash sound startles us all. We know what it is and we all head to the window where we know a bird has smashed into. Sure enough, the evidence immediately informs us of the bird’s fate. I had to go outside to confirm that there was nothing I could do. She was so pretty, probably a little House Finch, and to honor her beauty and tragically ended life, I got the camera. I put the tiny body in the crook of a tree while deciding what else I could/should do and went into the house. By the time I came back out, a neighbor’s cat was carrying the corpse off. Well, I guess at least her body wasn’t wasted….an encounter of the SECOND KIND. I LOVE Crows and have a grandiose belief that they love me too. I even fantasize that they follow me. On this morning, I took the boys out to their favorite before school breakfast (Burger King) on the condition that we eat in the car. My secret plan was to have a Close Encounter! I’m always on the lookout for a great teaching moment and sure enough, we were treated to a Crow Show right there in the parking lot. I call this an Encounter of the SECOND and 1/2 KIND…they did “contact” my car for sure! All taken from inside the car! While hanging up a fresh Hummingbird feeder, I almost stepped on this little guy, or girl. I was thinking at first a baby female Grosbeak but no bandit mask…and besides way too early for babies. I put her up on the Hummer feeder to keep her from getting stepped on (or cat-captured). Definite contact, of the THIRD KIND. Well, I have not upgraded to a Premium blog site yet so I cannot show you the hysterical video I took of thwarting the intrusive squirrels who climb the seed feeder pole and knock it to the ground so they can stuff their silly cheeks with sunflower seeds. This is an ongoing problem. I’m not actually bigoted. I hold Squirrels, despite their rodent status, as equal to all the other animals I like to feed. But the squirrels vacuum up the crow food each morning and continuously knock off the bird feeder, often breaking it into pieces, so I feed them in THEIR (yes, segregated) area, under THEIR trees. This does not work. They insist on amalgamating! I read somewhere that if you spray WD40 on the pole of a feeder, the squirrels can’t climb it. But I worried about it making them sick, so I sprayed PAM (the non-stick cooking spray). IT WORKED!! That’s the video I wanted to show you. The squirrels leaping at the pole, expecting to be able to climb to the top to pig out, and repeatedly sliding helplessly back down! It only lasts about 6 days (maybe because of our rain) so the pole needs to be re-treated, but hey, I went to Costco and got enough to last until maybe they learn and give up? (right…like they will give up…) But I feel a responsibility to continuing my years-long practice of feeding all my local birds, so I continue the battle with the squirrels, Encounters of the IRRITATING KIND! I have a favorite chair in my living room. It sits in the sunny nook of a corner window and rotates so I can see outside in comfort. It’s not just where I sit to warm up, or to watch the birds in my yard, but it is a special chair filled with connections and memories. It belonged to my “adopted” sister’s Mom, Ruth (don’t even try to figure that out) and was given to me when Ruth passed away. And it’s BLUE! On this day, sitting in my chair, I spotted a small bird out in the yard, another small Sparrow. When I got closer, I put out my hand and she walked right into it…again and again. I lifted her up to put her on the seed feeder and then could see it was an eye infection. Another video I couldn’t post showed her attempts at flying when I tossed her up in the air. She’d flutter back to the ground, I’m realizing now because she couldn’t see where else to go. I put her in one of my small bug containers for the ride. It was quite a drive to get there and most of the way she was quiet but I cringed when I could hear her flapping around in that confined space. They also coached me in how to contribute to the prevention and spread of bird conjunctivitis. Apparently it’s quite common amongst the Finch population and it takes some work to stop the spread. (It may be why the first bird crashed into my window and why the 2nd was sick also.) We need to clean (like seriously, with bleach) the bird feeder at least once a week and rake up all the droppings (seed shells, etc.) It’s also a good idea to take down the feeder now and then to let the current population “disperse “. That one will be harder for me as watching the feeder is a treasured part of my daily routine. This so specifically an Encounter of the THIRD KIND, I came back home wanting to go and get a pet bird. I can still FEEL her little feet on my finger! Word is out in our neighborhood that we have had several visits from this pair of Bald Eagles. A few days ago, literally, as I was sending out an email to some dear friends about the Decorah Eagle Cam website, (http://www.ustream.tv/decoraheagles) I heard that unmistakable scream right outside my window!! “As I was sitting here sending you all the link about my beloved Decorah Eagles, I heard eagle-screaming right outside my window! I ran outside without my camera but witnessed the most amazing thing. There were FIVE BALD EAGLES circling my deck!! It looked like two were fending off or chasing the other three. Or maybe it was some kind of mating ritual. The twosome flew very close together in large and then smaller circles. Then they landed on the top of the biggest tree in front of my house. The other three flew off into the distance. This might be the same pair I watched the other day, cruising our neighborhood for prey or a nesting site (although it seems late in the year for that latter). Not sure why they are hanging out here. I ran in for my camera but just like the other day, it is so gray out it was hard to get much more than a silhouette. Wish they would have stopped by yesterday when that sun was so bright. My neighbor Mimi knows about my bird obsession (similar to her fruit tree obsession…you rarely see Mimi on the ground, instead of in a tree top, pruning away.) But she also goes for walks most days. She takes her blind, deaf dog Murphy for a walk, well, Murphy AND her two cats, Moses and Purrcy. They make quite a sight sauntering down the street, in a line; the dog, the woman and these two cats who have trained themselves to traipse after her just about anywhere. She called me from her walk yesterday and said “Kathie, your Eagles are back” and told me where. I grabbed the camera and walked up the street. Beautiful sunny day. Some minor trespassing, but finally, even with my little point and shoot Canon, I got these pictures! Not sure how to number this Encounter but as strange as it might sound to some, I believe this was of the FOURTH KIND, through some connection bigger than I can explain. PS By the way, the little bug container I used to transport the sick House Finch in, was knocked off my back porch last night and trashed. I wondered if I had slept through another wind storm or something. But then I saw them. Those dang SQUIRRELS! Foraging around in the broken box for the last of the seeds I had put in there for the little bird. Would it be wrong for me to invite those Eagles back for some Squirrel Gumbo??? OK, OK, I know. That’s just my impatience talking…. AHH, gotta go. I hear screaming and cawing outside! By the way, if you have read this far, Thank You. It was a long week. I’d really appreciate comments and also that you pass this on to any bird people you know! Some of today’s ideas were borrowed from one of my favorite movies Close Encounters. We at PAWS Wildlife Center are happy to inform you that this Purple Finch was successfully rehabilitated and released back into his or her natural habitat. I followed their advice and after taking them down for a week, now clean my feeders regularly. I have not seen any more sick birds and no further Window Deaths have occurred. I do have a little Narcissistic Junco who every morning primps and talks to himself at my car’s side view mirror. Wish I could include the video. Time to upgrade I guess.